When The Hunger Games premiered in 2012, I was disappointed but hardly surprised. While the series had thrilled me upon reading, I figured any adaptation would be largely toothless, a strung-together series of sanitized action setpieces built around a solid performance from an excellent actress - and I was pretty much correct. What I didn't expect was that the addition of Francis Lawrence as the director for its sequel would make such an impact... but it certainly did. Catching Fire wasn't just better than its original in every single quantifiable way, it was also a legitimately excellent modern sci-fi movie by pretty much any standards, and it raised the bar for what I expected from the series' conclusion, the unfortunately-split Mockingjay Parts 1 & 2. While I don't think the movie lives up to its second entry, at least not on its own, a stellar cast and some excellent, surprisingly measured drama make it a worthy successor and keep me excited to see if the films can nail the landing in a way the final book (well-plotted but shoddily written) failed to do. The Hunger Games: Mockingjay - Part 1 begins pretty much where last year's entry, The Hunger Games: Catching Fire, left off: Jennifer Lawrence's Katniss pulled from the arena by a group of rebels seeking to use her image to inspire the outer districts to rebel against the Capitol, while her partner, Josh Hutcherson's Peeta, has been left behind with a few other tributes to the tender mercies of President Snow. Katniss is struggling with PTSD, dealing with the aftereffects of, uh, being forced to murder a bunch of teenagers on TV, and she doesn't feel even remotely interested in rebellion right now, but she finds herself unable to escape from the conflict for long, as her power as a figurehead for either side begins to outweigh her humanity in the eyes of her allies. The Hunger Games: Mockingjay is a large book, far more expansive than either of the first two and lacking in the structural skeleton of the Hunger Games themselves. Many readers (wrongly, in my opinion) consider Mockingjay to be the series' low point, but I largely disagree. It's intense, visceral, at times even harrowing in a way that the more sanitized sci-fi violence of the Games never could be. 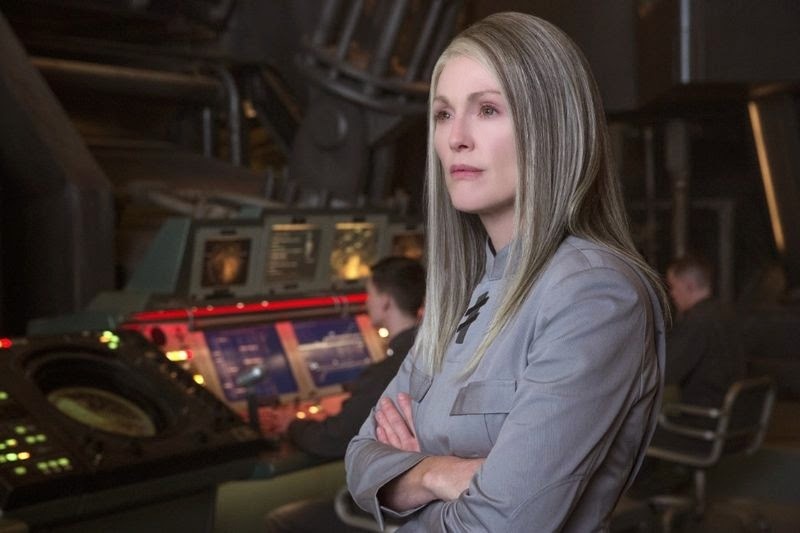 However, Mockingjay - Part 1 focuses on the build-up to the explosion, on the roots of the rebellion, making it a rather meditative penultimate entry. There's a lot more examination of propaganda and iconography in war than there are explosions, and there are at least four or five scenes that feature nothing but characters watching TV, trying to figure out through the interviews given on the other side what message is being sent and how to counter it. No, it never goes into quite the depth of something like 2012's excellent Chilean film No, which explicitly followed an advertiser creating commercials for revolution, but it does illustrate why I like the Hunger Games franchise so much more than most modern sci-fi: It has ambitions to do more than simply entertain, and it isn't afraid to make you wait to get to the 'excitement'. The bloated, action-lite entry could have easily fallen apart, but it finds something for every regular to do - Josh Hutcherson in particular finally has a character trait besides mooning over Katniss, and it turns out he can act! - and introduces a small handful of excellent actors in strong roles. We all know Jennifer Lawrence can give a nervy, emotional performance as Katniss, and her near-crippling PTSD in this film gives her a little more weight to play with than her last two performances. Philip Seymour Hoffman, in his final role, is brilliant and characteristically subtle as a political mastermind bringing a revolution to life even as he forces it to make the million small compromises that defeat the purpose of rebellion in the first place. Julianne Moore is excellent as the harsh President Coin, leader of the drab, militaristic District 13 who is finally, slowly learning politics, while Game of Thrones' Natalie Dormer is allowed to get a bit fierce as thrill-seeking director turned cunning propagandist Cressida, though I almost wish there was just an entire movie following her, now, because unlike Moore, Dormer isn't given nearly enough to do. The Hunter Games: Mockingjay is a dour movie, but it's a thoughtfully dour movie - indeed, I'm hard pressed to come up with a more considered, intelligent blockbuster out this year. Like Captain America: The Winter Soldier, Mockingjay asks its viewers to consider questions of governmental power and oversight, but unlike Marvel's flawed masterpiece, Mockingjay lets its ideas stand on its own. After one brief action sequence early on (quickly repurposed for propaganda purposes), the film relies far more on human drama and battling ideas than fisticuffs and explosions for its tension. Only Snowpiercer, Joon-ho Bong's similarly revolutionary fable, is a stronger mainstream(...ish) soft sci-fi movie this year, and I'll be eager to revisit that comparison once I see the final movie of Hunger Games, as the two are living in very similar thematic territory. I'm torn on the decision to make Mockingjay into two films. On the one hand, the film finds a killer endpoint, and spending the entire movie building to that moment makes the sudden, realistic violence of the moment all the more sickening and shocking, even for those who read the book and knew the twist. It gives weight to something that, had it been resolved in under an hour, would have been largely weightless. On the other hand, it makes for a fairly meandering, relaxed film - it's not Deathly Hallows Part 1 level bad, but there are instances where you can tell it was stretched mercilessly. Still, I mostly forgive Mockingjay its split (... mostly); clocking in at under 2 hours, the film is surprisingly fleet for a modern blockbuster, and rather than filling its extra runtime with extraneous action, it uses it to flesh out characters like Liam Hemsworth's Gale and Elizabeth Banks' Effie. It's not necessarily a good decision and this definitely isn't a 'complete' film, but it works better, at least, than it did for Harry Potter or The Hobbit. There's a reason the scores of Hunger Games imitators that popped up in the wake of its success - such as this year's relatively solid The Maze Runner and the largely execrable Divergent - find themselves unable to match Suzanne Collins' dystopian epic at the box office (or among its fans), and The Hunger Games: Mockingjay - Part 1 cuts right to the heart of it. Collins' story (and Francis Lawrence's adaptation) treats its world with a seriousness that those stories never do. This is a character-driven sci-fi series deeply concerned with the human cost of revolution, with the consequence of decision. Collins doesn't pull her punches in how damaging the events of the story are on Katniss; Lawrence doesn't hesitate to make Katniss a character full of rough edges and unsympathetic when she has to be. The Hunger Games: Mockingjay - Part 1 is, as I said above, a fairly dour movie and an unfortunately incomplete one, but that doesn't hold it back as much as I was worried it would as the series continues to grow into one of the best film franchises of the 2010s.